The Certified Registered Nurse First Assistant certification provides the Registered Nurse with the specialized credentials that indicate specific training has been completed to care for surgical patients. The Certified Registered Nurse First Assistant certification is recommended for RNs who assist in surgical procedures, as well as perform pre- and postoperative assessments. Prepare with our CRNFA Study Guide and Practice Questions. Print or eBook. Guaranteed to raise your score. Get started today! In order to take the Certified Registered Nurse First Assistant exam, the applicant must be a licensed Registered Nurse with a Bachelor’s Degree or Master’s Degree. At least 2,000 hours of employment as an operating room nurse performing first assistant tasks are necessary. In addition, a credentialed RNFA education program should be completed. There are four 3-month windows in which the Certified Registered Nurse First Assistant exam may be taken and the exam can only be taken one time during each exam window. The cost to take the exam is $425 for members of the Association of perioperative Registered Nurses (AORN) and $550 for nonmembers. CRNFA Flashcards. Proven CRNFA test flashcards raise your score on the CRNFA test. Guaranteed. The Registered Nurse is allowed 3 hours to complete the Certified Registered Nurse First Assistant examination and it consists of 150 multiple-choice questions. The exam consists of questions pertaining to all aspects of perioperative care of the patient, with almost half of the exam focused on intraoperative procedures. This includes questions on patient safety, specific disease states that may place the patient at risk, and operating room procedures. There are also questions pertaining to the professional standards of the RN with Certified Registered Nurse First Assistant certification and ethical issues. The Certified Registered Nurse First Assistant certification is valid for 5 years. There are several ways in which to meet the requirements for recertification. The RN would have to work at least 1,000 hours as a CRNFA and complete 200 continuing education hours or work at least 500 hours as a CRNFA and complete 300 continuing education hours. There is also the option of obtaining points to qualify for recertification. These points can be obtained by completing various professional activities in order to be eligible for recertification. Another option is to retake the Certified Registered Nurse First Assistant exam and work at least 1,000 hours as a CRNFA. Explore our free CRNFA review provided by Mometrix. Check out our premium CRNFA study guide to take your studying to the next level. If you benefit from these materials, just click the link below! 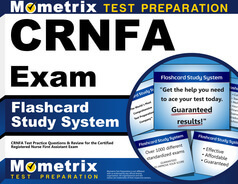 To compliment our CRNFA book, we also offer extensive CRNFA flashcards for even more CRNFA test prep help. We hope you enjoy our products! Your purchase helps us make more great, free CRNFA certification content for test-takers just like yourself.